The Chicago Bears offense turned up the heat on a cold day in Cincinnati, defeating the Bengals, 33-7, on the heels of 147 yards and two touchdowns from RB Jordan Howard. Rookie QB Mitchell Trubisky had a strong game as well in the win, completing 25-of-32 passes for 271 yards and a touchdown. Trubisky also rushed in a touchdown as the Bears out-gained the Bengals by a margin of 482 yards to 234. Bengals QB Andy Dalton completed just 14 of his 29 pass attempts for 141 yards and a touchdown early in the first quarter, but the Bengals offense couldn’t muster much all game against the Bears. 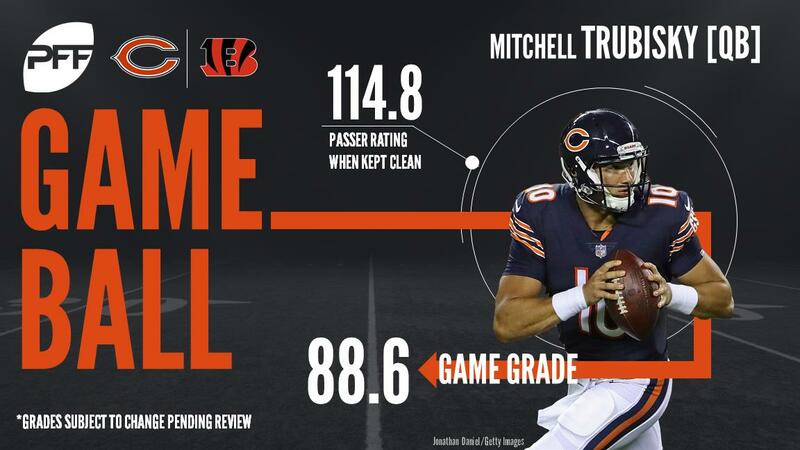 Chicago caused two turnovers in the contest in total, and with that, we give you our PFF-exclusive takeaways from the contest for each team. Nothing new from the Bengals left tackle, as he allowed two sacks and four other hurries. That brings Ogbuehi’s season sack total to eight, the most of any left tackle in the NFL. Green looked out of sorts all day, dropping a pass and fumbling another. He also had multiple contested catch opportunities that he failed to haul in. This was not the A.J. Green Bengals fans have come to expect. Billings was a liability all day long in run defense. He simply didn’t have the lateral agility to run with the Bears outside-zone-heavy attack and got continually taken out of his gap. Jackson was one of the only members of the Bengals defense who showed up to play Sunday. He saw two targets, breaking one up and yielding the other for only three yards. The Bengals have something special in Jackson. This was by far the best the rookie quarterback has looked all season. He was an impressive 7-of-9 for 114 yards on intermediate passes (10-20 yards downfield). Maybe most encouragingly though, Trubisky went 6-8 for 74 yards when faced with pressure. Howard’s patience and vision were on full display in this one. He continually caught Bengals defenders out of their gaps with his patience pressing the hole. The Bears back broke four tackles on 23 attempts and averaged almost 4 yards after contact per carry. Fuller was as good as it gets Sunday. He saw a hefty nine targets, but only allowed three catches for 14 yards. He also broke up three passes. When guarding A.J. Green, Fuller yielded just one catch for four yards on four targets. It’s a good day when both starting corners grade out above 80. Amukamara was thrown at eight times and allowed five catches for only 39 yards with three of those catches resulting in defensive stops.